The backyard Hostel is an initiative of non-profit organisation C-re-aid. It was opened in June 2015 in order to help finance the organisation’s sustainable architecture projects. The hostel is a great place to welcome our friends and families as well as the students and volunteers who work with C-re-aid. It is also a fine destination for you to stay and really enjoy your time in Moshi, Tanzania. Check out our rooms and fares and decide whether you want to enjoy the comfort of a bed or camp in one of our tents. 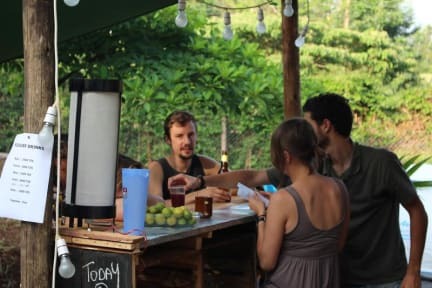 The Backyard Hostel offers you the opportunity to play volleyball or badminton, relax in a hammock, make a barbecue or simply enjoy a cold drink at our bar. So even if you don’t spend the night, you are most welcome! We are located just outside of Moshi city, in a vibrant area called Rau, so it is both calm and easy to reach. And if you want to enjoy a night out in one of the city’s bars and clubs, the hostel is a great starting point. It is an easy walk to town, to the nearest pool and to many local restaurants and pubs. Local buses stop next to our hostel and can take you to town in a few minutes! We are located next to the Rau main road and taxis find us easily! Follow us on social media and don’t miss out on great offers and activities. We also offer our guests day trips, safaris and Kilimanjaro climbs through a renown local partner, True Views Tanzania. And remember, by choosing The Backyard you contribute to the implementation of our development projects.